May 23, 2012 - Pratt & Whitney Canada has begun testing of the compressor for the next generation regional turboprop engine, a key step in the company's technology demonstrator program. The high-efficiency compressor is a core element of the new engine and the test hardware has already run to the full range of aerodynamic design points. Key engine characteristics such as component efficiency and pressure ratio will be validated by the demonstration program, bringing the best technology forward. "The next generation turboprop engine is a totally new centerline engine that will deliver a 20 per cent improvement in fuel burn over today's fleet using the latest technologies of our next generation product families," said Richard Dussault, Vice-President, Marketing, P&WC. "Our new engine will deliver the economic and environmental benefits that will sustain the regional turboprop's competitive advantage for airlines serving short-haul, high-frequency routes." P&WC's PW100 family of engines has led the regional turboprop segment since entering service more than 25 years ago. 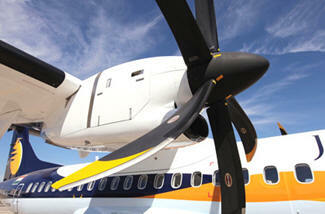 The company has more than 200 million hours of flying experience in the regional turboprop segment. P&WC's new offering will be a fully integrated propulsion system including engine, nacelle, propellers and engine systems, bringing the most advanced systems integration technologies to this product. "We continue our strategy of leveraging the entire spectrum of research and development capability to bring the best technology to our engines," said Dussault. "We are investing in this next-generation technology demonstrator to offer real engine performance data to potential OEM customers." Pratt & Whitney continues to see a sustained demand for regional turboprop aircraft and estimates a market for 3,000 regional turboprop aircraft in the next 20 years, with the majority of the regional aircraft in the 70 to 100 seat capacity. "We are experiencing excellent growth in the regional turboprop market and believe demand will only increase," said Richard Dussault, Vice-President, Marketing, P&WC. "Deliveries of turboprops have grown steadily at P&WC since 2003. All indicators point to an acceleration of demand and we have taken the right steps to ensure that we can meet that demand in a timely manner, with products that exceed our customers' expectations." Today P&WC produces engines for the ATR 42 and ATR 72, Bombardier Q400 and XAC MA60 aircraft. P&WC recently marked the delivery of its 2000th PW100 family engine to ATR, a milestone that's indicative of strong demand for turboprop engines from regional airlines. ATR delivered its 1000th twin-engine ATR 72-600 aircraft to Spanish airline Air Nostrum in early May. Demand for the PW150A engine, powering the Bombardier Q400 aircraft, continues to be strong and P&WC expects to exceed the 1000th-engine-produced mark in 2013. There are currently more than 49,000 engines in service on more than 28,000 aircraft operated by some 10,000 operators in 200 countries. The most extensive support network in the industry, which includes more than 30 company-owned and designated service facilities, supports this global fleet.